Outright Military Victory by Rebels? Militarily, if the rebel site maps and discussion are correct, the war may conclude with outright military victory by the rebels. Whether or not you believe these maps or such talk, please note the mainstream media silence on the civil war in the last two weeks. At best, one can safely assume Kiev has nothing good to report. Rebel sites now proclaim Ukraine offensive in Donetsk and Lugansk have failed. 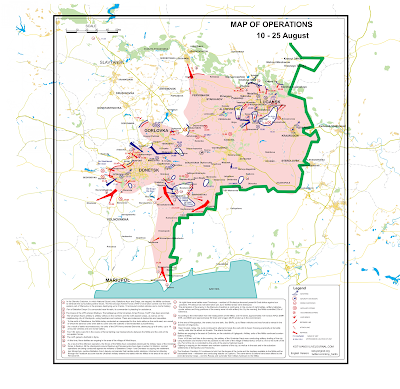 Let's take a look at a translated map of major military operations August 10-25, 2014. The map source is Colonel Casad. Translation by Kot Ivanov and Anthony Hartin on SLAVYANGRAD.org. 1. In the Olenvka Cauldron, Nation Guard units trapped. The Militia [rebels] continues to eliminate surrounded forces, destroying up to 8 tanks and 19 armored vehicles. 2. Part of Batalion Dnepr-2 is surrounded. It's commander is pleading for assistance. 20. Southern Cauldron continues to hold but Junta [Ukrainian] losses substantial. [Possible] Military trophies substantial. Encircled troops offered exit to Russia if they surrender military hardware. 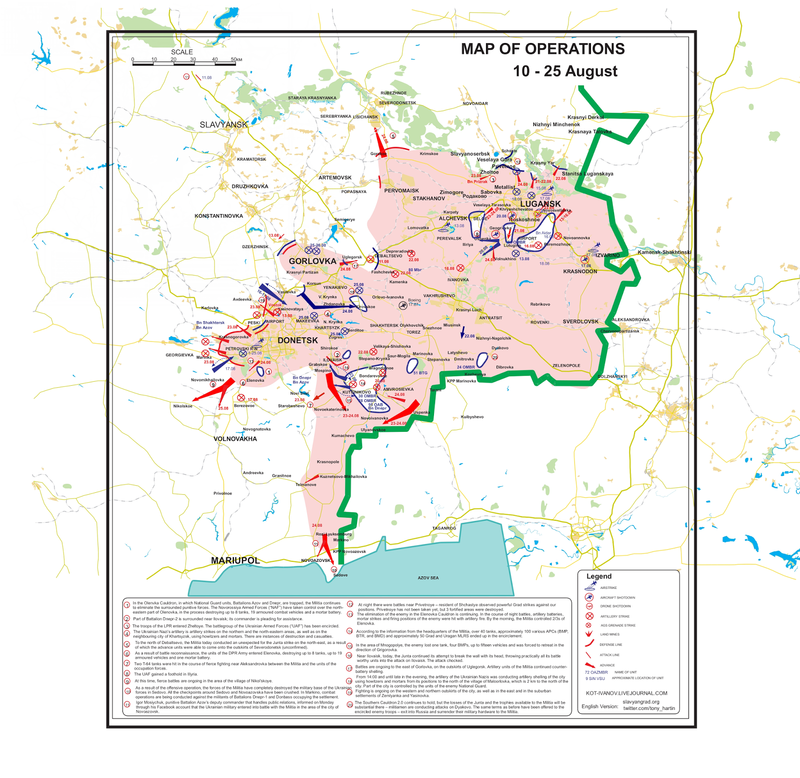 From the Novorossiya Military Briefing – Situation as of August 22, 2014 in English, by Anthony Hartin. 1. By August 22nd, 2014 it became completely obvious that the Junta will not be able to occupy Donetsk either by August 24th, 2014 or by September 1st, 2014. The general offensive that began on July 1st, 2014, and which was intended to crush Novorossiya, has chocked. The junta suffered key defeats near Shakhtersk and Krasniy Luch, when it was unable to cut off the DPR from the LPR, following which it became mired in bloody battles for Ilovaysk and Yasinovataya. At the same time, the southern battlegroup was crushed and routed in the Southern Cauldron. 2. It may still be too early to tell, but, overall, there is every indication that the army of Novorossiya is winning the strategic defensive operation. In the last several days, there has been a clear weakening of the Junta’s onslaught on the People’s Republics, as evidenced by the convulsive attempts to advance on Ilovaysk at all cost and the meandering of the semi-encircled troops to the south-west of Lugansk. 3. The fact that Yasinovataya and Ilovaysk were able to withstand the Junta’s onslaught completely derailed the announced assault on Donetsk. And the column of white trucks [Note: the Russian humanitarian aid convoy] that passed in the direction of Lugansk on August 22, 2014 vividly demonstrated that the plan of complete encirclement of Lugansk had failed and the breakthrough to Novosvetlovka and Khryashchevatoye had been pushed back. At the same time, the situation is worsening daily for the enemy troops that operated to the south-west and south of Lugansk, as the self-defense militia forces are conducting increasingly bolder and more decisive actions aimed at creating a new cauldron, which threatens to trap various units of three separate brigades and the attached support assets. Remember that only 4-5 days ago they were shouting that they were already in the center of Lugansk, sweeping the city. 13. Overall, unless there is some sort of political conspiracy, the war will continue in September with the same ferocity, and its significance will gradually move away from the question of “Will Novorossiya survive or not” to the question of “What will the borders of Novorossiya be after the war”. In general, all of our sources in Novorossiya in the last days radiate optimism, and some even euphoria. Nevertheless, it is worth remembering that the Junta, though it lost some battles, did not lose the war yet, and after pulling up new forces and regrouping, it can either carry out a new attack or begin to build a strategic defensive line to leave Novorossiya as a war-torn stub, which it would be systematically destroying with artillery. 14. It should be understood that if the Junta puts together another offensive battlegroup somewhere, it could easily organize a new operational crisis for the Militia. So try not to indulge in excessive euphoria, winning the battle does not mean winning the war. There is a long and bloody struggle ahead of us. 15. In general, things we are improving, the trend is favorable. And yes, thanks to those who have already started to send us the first parcels with autumn-winter uniforms. Soon those will be needed. Overview of the Situation in the Donbass Region – August 24, 2014, in English, translated by Daniel Mikhailovich. Even recently, it might have seemed laughable, but today the fighting has begun in the area of Novoazovsk, where a powerful anti-aircraft defense node and a hodgepodge of different units of questionable combat capability have been stationed since April to cover the border with Russia. After the Southern Encirclement 2.0 was created, the Militiamen began to probe the other checkpoints to the south-west of Marinovka, and were surprised to find out that there are almost no defenses. All the forces were drawn up to the main front line, creating a gap to the south of Amvrosievka, which was only partially covered with the covering forces. At first, the Militia’s saboteur-reconnaisance groups (“SRG”) began to infiltrate to the south-west, which has led to the capture of the “Uspenka” border checkpoint. After that, the Militia broke-out to the coast, as there were no serious forces of the Junta. As a result, several SRGs moved almost to Novoazovsk and the towns of Holodnoe and Sedovo, firing and attacking some checkpoints. The Militia obviously doesn’t have enough forces there to seize and hold the towns (let alone capturing Novoazovsk or Mariupol); but judging by the reports that a bomb shelter has been opened in Mariupol, the command of the Junta in this area lost their nerve. It is not only that the gap along the border continues to expand, there is also a threat (even if remote for now) to Novoazovsk and Mariupol; as there are few Junta’s forces there, and nobody knows what can appear from across the border. Moreover, the gap in the front, to the south of Amvrosievka, also does not seem optimistic. In general, what is happening now is not yet an offensive with definite goals, but just a distracting raid in the rear of the enemy, which turned out to be an unpleasant surprise for the Junta. To be honest, very few people expected the fighting on the coast of the Sea of ​​Azov to start so soon. In general, the trend is favorable for us. Today near Ilovaysk the Junta has continued its attempts “to break through the wall with its head”, sending almost all of the combat-ready forces to attack Ilovajsk. The attack bogged down even before the Junta talking heads could declare that Ilovajsk has been taken once again. This is a very weird stubbornness, given that a more effective plan would involve encircling and taking Mospino, and the gaps in the front to the south of Amvrosievka. The strategic point of the attack is long gone; it is an attempt to reverse the situation with insufficient forces – because even if by some miracle the Junta takes the ruins of Ilovaysk and pushes out the Militia, it will not go beyond one tactical success against the backdrop of the bleak strategic situation. Fighting continued, with both sides largely staying on their positions. The Junta’s mechanized units tried to move towards Miner and Thorez, but didn’t make it far. Theoretically, these battles are good for the Militia, as the Junta spends reserves there quite aimlessly. That has made the punitive battalions (volunteer units made up of activists/neo-nazis/released criminals) suspect that the Junta command deliberately drives the southern battlegroup into a meat grinder. (That is one version – that they are agents of the Kremlin – another, because that is how Poroshenko gets rid of radical elements). All in all, another week or so of such operations, and the Junta there will be in for a surprise. Southern Encirclement 2.0 has held out so far, but the Junta losses and the Militia trophies there will be considerable – the Militia is currently attacking on Dyakovo and offering the surrounded forces the same conditions as before – retreat to Russia, leaving the vehicles to the Militia. In the north of Donetsk the Junta seems absolutely exhausted, only pretending that the failed offensive is proceeding via the SRGs’ forces and continuing shelling; whereas the self-defense Militia forces managed to start an offensive towards Uglegorsk which, although not yet taken, hardly looks like a springboard for the Junta’s attack on Yenakievo anymore. The Militia will try to take it in the coming days to protect Gorlovka and Yenakievo and prevent the bisection Donetsk-Gorlovka battlegroup. In general, it is now possible to say conclusively that the attack on Donetsk has failed, and there is no direct threat to the city. To the north of Debalcevo, the self-defense forces delivered an unexpected blow to the Junta, towards the north-west, with the result that the forward units were able to move to the vicinity of Severodonetsk. There were overly optimistic statements that the Militia had been about to take back Severodonetsk and Lisichansk, but in fact, there is a lack of Militia forces there, and taking two major cities at once would be quite problematic, especially with the advance SRGs alone. The Junta offensive against Lugansk failed. The enemy has been driven off from Hryaschevatoe; they are still holding by Novosvetlovskaya, but this is a purely defensive action. The self-defense militia forces have already started an offensive against Lutugino and Chast’e. The loss of either one of these would be a complete disaster for the battlegroup besieging Lugansk, as it would be dissected into several parts; although some of it is actually in operational encirclement even now. Today, predictably, there was an attack from the south in the Volnuhino area, and as a result, there is a direct threat to Lutugino; there are already militia combat recon groups on the outskirts. The general meaning of combat here is that if the militia take back Lutugino, they will then be able to fully control the route Lugansk-Krasny Luch, which would greatly enhance the connectivity of Novorossiya’s territory and the coordination of its armed forces. In this regard, Lutugino and Debalcevo are the key nodes of the transport network in the region, and control over them is a part of the struggle for the operational initiative. In general, the situation, even though it is still difficult, is obviously improving. In a number of areas, the militia are now on the offensive, while the Junta offensive has petered out and stopped almost everywhere. These excerpts do not seem irrational, euphoric, or overly-optimistic. And while I cannot assess the accuracy of the reports and maps, I can repeat: "If these assessments are anywhere close to accurate, Kiev is in serious trouble". Rebel forces talk of outright military victory, and that certainly does not seem to be out of the question.